Ah...they grow up so fast these days. One day, you're watching your girl frolic in the grass with her friends and the next...holy moly...what happened? Your gal must have aged 80 years overnight! Ohhhhhh, she's just using this Girl's Old Lady Costume Kit! That makes a lot more sense. Phew, we were nervous! 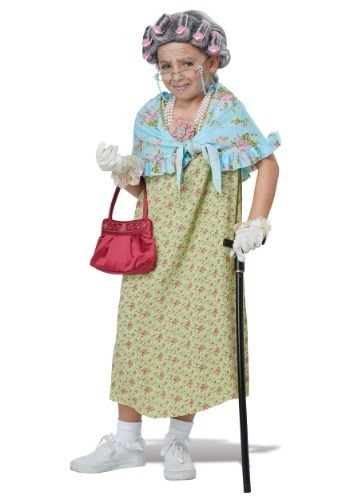 It is a clever little tool to turn any tot into a grandma faster than you can say, "When I was your age..." Sadly, it can't make her calmer, more fiscally responsible, or any more amenable to an early dinner and bedtime, but hey, what do you expect from a costume kit? This senility-inducing set is super-fun and a little bit wacky. It comes with a grey wig set in pink curlers, as well as a blue floral shawl, and a flower clip. She may want to add some specs, a cane, gloves, or a purse full of hard candies to complete the look. Or she may want to practice working in a midday nap! Well, we're glad your girl isn't growing up quite so fast, but still, time flies. Encourage her kooky costume with this transformative kit that may even give her a glimpse into her future. Just make sure she doesn't cover your couch in plastic while she's in character!